Usually when I see a sign that says "Free Books," I have two simultaneous reactions. One the one hand, I get excited because I love books and I don't have much money, on the other hand, I know that they're usually free for a reason so I don't get my hopes up. Well, a few months ago at SFTS's Southern California campus, when I was there for my class on Formation for Ministry, I found a gem. There was a table full of free books so, naturally, I browsed through them. I found a couple of gems, actually, including Jesus-God and Man by Wolfhart Pannenberg. Who knows when I'll actually get around to reading it, but it's sure to be a valuable resource. 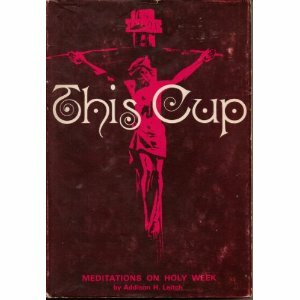 There was another one called This Cup by Dr. Addison Leitch, which I had thought would be interesting but had thought little more of. Today I pulled it off of my shelf as I was looking for a good read for Holy Week (I read Christians at the Cross by N.T. Wright last year and I couldn't recommend it more highly). After reading the first couple of pages, I knew it was gonna be a good one. I googled the author's name and discovered that Leitch had a PhD. from Cambridge University and taught at Gordon-Conwell Theological Seminary among other schools. Interestingly enough, he was married to Elisabeth Howard Elliot after her first husband Jim Elliot, the famous missionary martyr who was killed while attempting to evangelize the Waodani people in Ecuador, had died. But even more interesting was this... when I opened the front cover I found a name jotted inside. It said "Jack B. Rogers, Spring '73". Jack B. Rogers happens to be the founder of the Southern California Campus of San Francisco Theological Seminary and author of about 48 published works including Jesus, the Bible, and Homosexuality (perhaps his most controversial and important work). I don't know if he was a student in 1973 or if he was teaching by then, but either way, I've got his book. Some of you are thinking, "only Wes would get excited about something like this" but, whatever the case, I'm excited for my Holy Week reading this year. I hope you don't want your book back, Dr. Rogers.